An innovative idea to produce healthy food, with utmost care for the quality of the product and respect to customer, is the best way to succeed. Sante is a family company established in 1992 by Andrzej Kowalski with brothers, Wojciech and Marek. Sante is known for the quality of its products and the particular care it takes in giving customers foods that are best for their health. Today, the company is an expert in the market of healthy foods in Poland and worldwide. Its rich and diversified offer includes ca. 250 products, including: breakfast products, cookies, bran, wheat bars, groats, nuts and dried fruit, vegetable spreads and terrines, vegetable beverages etc. Among the unique products offered by Sante are premium quality, high fibre oat bran, low-sodium sea salt, Granola, Fital, Musli Lo, Smart Teens - breakfast cereal for children, and the GO ON! brand (GO ON! Peanut butter: 100% peanuts, GO! almond butter: 100% almonds, GO ON! protein bars), or the “Treasures of the Earth” series with superfoods. The high quality of the products, with no artificial additives, is the pride of Sante. The mission of Sante is to deliver top quality foods with a beneficial impact on the customers’ health and wellbeing, as well as to promote knowledge on healthy eating and lifestyle. Sante is the experts on diet, food technology and eating implement their projects based on the latest scientific research and up-to-date eating tendencies. Produced with cutting-edge manufacturing technology, products by Sante maintain their full nutritional value and taste delicious. Another important element of Sante’s activity is pro-health education. Sante organizes conferences and lectures on proper eating, as well as nationwide events and meetings with experts and authorities on health, including outstanding doctors, therapists, trainers, spiritual guides or artists. The company regularly publishes health-promoting materials based on the latest research in the field of nutrition and medicine. 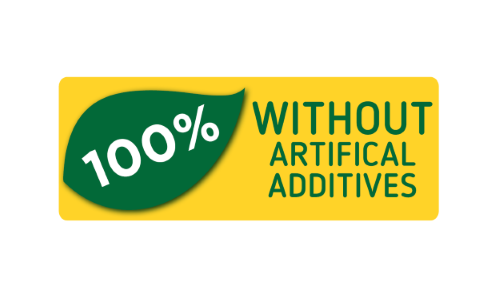 Sante prides itself on manufacturing products which contain only natural ingredients, with no added preservatives or flavour enhancers (including glutamates), artificial aromas and flavours, emulsifiers and raising agents. The company consciously abandons taste, smell or texture-improving agents or additives that are commonly used to extend product shelf lives. Sante experts on diet, food technology and eating implement their projects based on the latest scientific research and up-to-date eating tendencies. 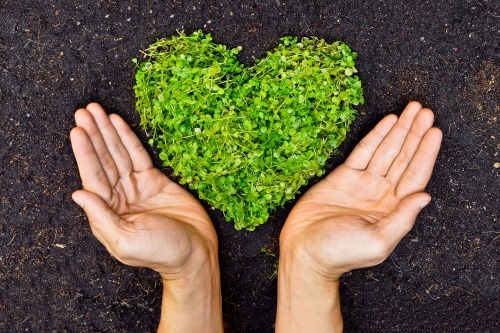 Sante offers unique, top quality products for conscious consumers, who want a guarantee that their food is free from chemical ingredients. Sante products contain natural flavours, which do not affect their biovitality. Eating Sante's products, you can be sure that you feed your body only with the best and carefully selected ingredients with the company’s guarantee of quality. Sante rigorously abides by the applicable quality standards and controls the whole production process, from the raw materials, through manufacture, to packaging. Sante uses cutting-edge technologies to guarantee that its products represent top quality and homogeneity. Sante controls the whole production process, from the raw materials through manufacture to packaging. All raw materials, semi-finished products and end products are only obtained from proven suppliers who satisfy the highest quality standards. The resources are tested in the company’s buffer zone, to make sure that only materials of confirmed quality are used. The warehousing system is based on the FIFO principle (First In, First Out). Among other strictly controlled factors is the shelf life of both the raw materials and the finished products. Quality is reviewed at each step of production. During the manufacturing process, the quality of raw materials is controlled by production line operators, while the Quality Department regularly collects samples from the production line for control testing. A control for metallic impurities is carried out with the use of highly sensitive metal detectors, designed especially for the food industry by CEIA, a company with a worldwide renown. The quality of the packaging is tested too (welds, cartons and pallets). Sante has implemented the following procedures concerning food quality and safety: a Quality Management System consistent with the Global Standard concerning Food Safety with the highest level of compliance approval, the HACCP Food Safety Assurance System and a Quality Management System consistent with ISO 9001:2000, the HACCP Food Safety Assurance System. Sante uses global cutting-edge technologies to guarantee that its products represent top quality and are homogeneous. Sante has at its disposal cutting-edge machine resources and produces its foods with the use of world's best technologies. The production process is carried out with state-of-the-art machines produced by world-class companies and innovative technical solutions, to obtain top-quality products at all times. The production lines in Sante’s plant are highly efficient, automated and computer-controlled through PLC drivers. Such solutions minimise the time of production while optimising the tasks performed by the employees, and guarantee that the end product will be of perfect and uniform quality. The process of manufacture and the quality of the end products are under continuous supervision of highly specialised personnel and the Quality Department. With its advanced manufacturing technologies, Sante guarantees product homogeneity (i.e. that the content of individual ingredients in each pack is consistent with the information on the packaging) as well as the consistent high quality and nutritional value of the products. Sante is ranked very highly in consumer surveys. In 2016, upon the decision of its consumers, the company won the prestigious “Super Brand 2016 - Quality Trust, Renown” award in the “healthy foods” category. Upon the decision of its consumers, Sante wins the prestigious “Super Brand 2016 - Quality Trust, Renown” distinction in the “healthy foods” category. The title is only awarded to companies which twice previously have won the “Good Brand” mark. Sante was distinguished with the mark in 2013 and 2014. Sante wins Forbes Diamond as one of the best developing companies. Sante wins VEGE Certificate for 92 products. And extends its breakfast product portfolio with new items, 100% free of artificial additives. Sante opens Sante Studio, a unique SPA & Wellness in Warsaw. In the studio, the customers have at their disposal pools with revitalised water, saunas (including Ganbanyoku, a Japanese rock sauna) and resting areas (Goldarium, a salt grotto, etc.). Sante Studio’s offer also includes modern biofeedback diagnostics (SCIO), SCENAR COSMODIC electrotherapy, beauty treatments as well as personalised therapies and rehabilitation. Sante wins a VEGE Certificate for 14 products. Sante wins the Superbrands title, “Polish companies” category. A project to establish Sante Studio, an education health centre in Warsaw, is drafted. The expansion of the building at 55A Jagiellońska Street, where Sante Studio is to be housed, begins. Chocolate Granola and oat cookies are distinguished with “Super Taste Awards 2012”. Production of oat cookies is launched in the Sante plant. Cane sugar (Demerara) wins the “FMCG Market Pearls” award. Additionally, Sante is granted the BRC Certificate for breakfast products, muesli bars and extradited products. Sante begins to import cane sugar from Mauritius and markets it in Poland. Granola is awarded the “Hit of Commerce 2008” title. Market début of Granola, a new series of products by Sante. Sante is awarded the “Cool Brands 2006/07” distinction as an innovative brand; for the second time in a row, the company also wins the “Business Gazelles” title. 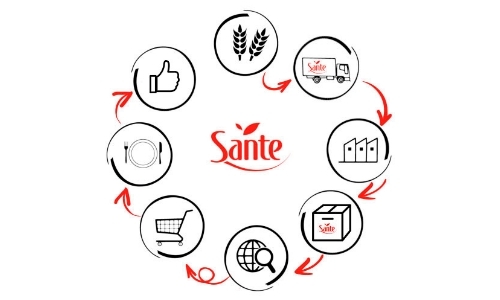 Sante implements a quality management system in accordance with ISO 9001:2000 and a HACCP system. The first muesli bars and puffed rice and wheat are produced. Sante is awarded the “Business Gazelles 2005” title for the fastest developing company in the segment. Purchase of a real property in Sobolewo, for a new production plant. The process of the building’s reconstruction and adjustment to muesli production is started. Conclusion of an agreement on cooperation with Alpro. Sante becomes the only distributor of the brand in Poland. Market début of the Fix soya cutlets and the crispy Crunchy. Commencement of cooperation with chains such as Makro Cash&Carry, Geant, Hit, Ahold, Leclerc, Carrefour, Auchan etc. Market début of the first muesli product. Establishment of Sante in Warsaw.